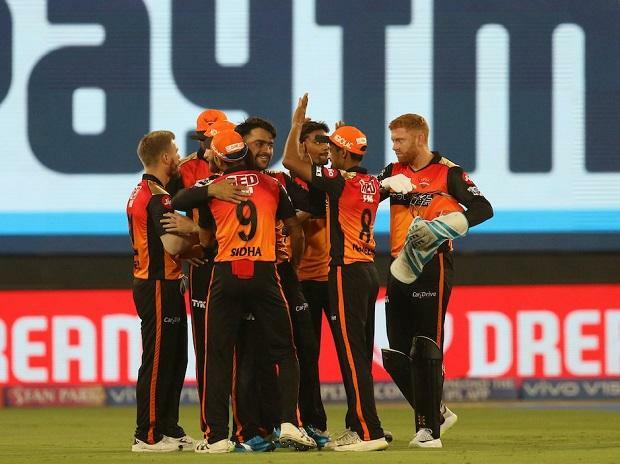 In Match 8 of VIVO Indian Premier League 2019 (IPL 2019), Sunrisers Hyderabad defeated Rajasthan Royals by 5 wickets at the Rajiv Gandhi International Stadium in Hyderabad on Friday and registered their first win of this edition of the tournament. Batting first, Rajasthan Royals put up a massive 198/2 in their 20 overs with Sanju Samson's century, the first of this season, and captain Ajinkya Rahane's well constructed 70-run knock. Sunrisers Hyderabad had just the start that was required to chase such a big target with David Warner (69 off 37 balls) hitting almost every ball out of the boundary rope for either a four or a six. Jonny Bairstow held the oher post beautifully with 45 off 28 balls. Yusuf Pathan and Rashid Khan were left on the crease to make much needed runs on time and they rose to the occasion, especially Rashid Khan (15 runs off 8 balls and 4-0-24-1) who scored the winning run. Rashid Khan was also bagged the Man of The Match award. For Rajasthan Royals, Shreyas Gopal (4-0-27-3) picked three wickets, while Jayadev Unadkat (3-0-26-1) sttod out with his figures.